Place all vegetables in a large pot which has been oiled or buttered inside. Sprinkle with salt and pepper and sauté over high heat for about 10 minutes. Lower the heat, cover, and steam for about 10 more minutes, being careful not to burn. Heat the stock to boiling. When vegetables are partially cooked, cover them with the boiling stock and add the bay leaf and garlic. Set over low heat to simmer until the vegetables are soft. Add the tomato sauce, stewed tomatoes, lemon juice and sugar and stir well. 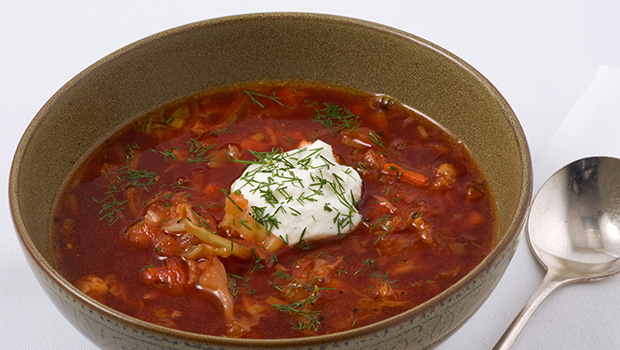 Quickly sauté paprika in oil and add to the soup, enhancing the color and flavor. Bring the Borsch to a boil, then lower heat and stir. Note: if chuck roast has been used to prepare the beef broth, cut into large pieces, and add to the Borsch before the final boil.